In this webinar, you'll hear from Amherst Central School District about how they leveraged Google Apps and Chromebooks to save money, increase productivity and collaboration, and extend learning beyond school hours. Get a peek at Amherst's decision making process, learn about the obstacles and challenges they overcame, and hear about the success they experienced with their implementation of Google Apps for Education and Chromebooks. Donna Frymire, district technology integration specialist, Amherst Central School District, Amherst, N.Y.
Anthony Panella, assistant superintendent of curriculum and instruction, Amherst Central School District, Amherst, N.Y.
Can't attend? All Education Week webinars are archived and accessible "on demand" for up to four months after the original live-streaming date. Did you know as part of your NCTM membership you can apply for Mathematics Education Trust (MET) grants, scholarships, and awards to help you in your career in mathematics education? MET provides funds to support classroom teachers in the areas of improving classroom practices and increasing teachers' mathematical knowledge. 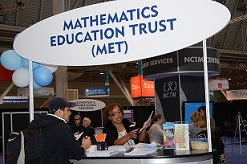 MET also recognizes outstanding contributions to the field of mathematics and provides grant funding for NCTM Affiliates to initiate professional activities or programs. We encourage you to apply for a grant or scholarship that will advance your career and help you increase your effectiveness as an educator. Funding ranges from $1,200 to $24,000 and is available to help math teachers, prospective teachers, and other math educators improve the teaching and learning of mathematics. Are you attending one of the Regional Conference and Expositions in Minneapolis or Nashville this month? Be sure to stop by the MET Station in NCTM Central to learn about this opportunity only available to members. Browse all grants and awards—but hurry! The deadline for many opportunities is this Friday, November 6. Deciphering Ratios with TI-Nspire™ Technology: Are They Fractions? Have you ever stopped to think about whether fractions and ratios are the same? The answer might surprise you. Designed for middle grades teachers using TI-Nspire™ technology, this webinar will introduce you to learning sequences within Building Concepts in Mathematics, an innovative program developed by TI in collaboration with thought leaders in mathematics education. You will receive a certificate of attendance, which may be eligible for professional development credit, after the webinar. Designed to recognize and promote hands-on math teaching in upper elementary and middle school classrooms, the Rosenthal Prize carries a cash award of $25,000 for the single best activity, plus up to five additional monetary awards for other innovative activities. The winning teacher(s) will have the opportunity to share their innovative activities with educators across the country. Click here to learn more. Launching in fall 2016, AP Computer Science Principles introduces students to the foundational concepts of computer science and challenges them to explore how computing and technology can impact the world. In this webinar, participants will learn why and how this new course was developed, how it differs from and complements the existing AP Computer Science A course, and the ways it attracts and engages traditionally underrepresented students with essential computing tools and multidisciplinary opportunities. Participants will leave with an understanding of what it takes to bring AP Computer Science Principles to their schools, how to identify teachers for the course, and the support available for curriculum implementation, professional development, and student recruitment. You’re invited to take a guided tour of 84 Activity Central, an online resource of standards-aligned lessons using TI-84 Plus technology to support mathematics instruction. It’s not too late to register for tonight's Core Advocate Webinar, The Coherence Map. The webinar is happening tonight, Monday, October 19th from 7:00 – 8:00 pm EDT. The Coherence Map is an interactive tool now available on Achieve the Core that allows teachers to see the connections between math standards within and across grades. Learn about the functionality of the tool and how math teachers can use it to support students' coherent understanding of mathematics. All are welcome – please share the registration information with your friends and colleagues! Use #CoreAdvocates on Twitter to share information during the webinar. Help build your students' background knowledge and vocabulary and improve their reading comprehension with these non-fiction and literary passages and question sets related to technology and engineering. Follow ReadWorks on social media to stay up to date with our newest curriculum! The nonprofit ReadWorks is presented by leading researchers and teachers in research-based reading comprehension instruction. Click on the city to visit the NCTM Regional Conference pages for complete information on programs, housing, and registration. Have an emerging leader who presented at your affiliate conference? Consider encouraging them to submit to speak at the one of the 2016 Regional Conferences in Phoenix, Philadelphia, or St. Louis. Call for proposals will close December 1, 2015.